In Maitriyana, the Universal Declaration on the Right to World Peace is preceded by 2600 years of teachings of spiritual masters who have been the foremost experts on the human right to peace that have existed in history. Thus, the sense of Purpose (Dharma) of the Free and Enlightened Being (Arhat-Bodhisattva) requires the States of the world to open their life practices to the transcendental milestone that involves creating a pacifist global civilization. It is precisely in the Buddhist Socialism which it is clearly reflected this search for peace as a universal value and archetype of human rights, which means that peace is not merely the absence of war but also the Cure (Nirvana) of the ills of injustice, ignorance and pollution by removing all kinds of violence, whether political, economic, cultural and environmental, both individually and at a collective level. This happening of solidarity in the world involves ethical evolution and Spiritual Awakening (Bodhi) of humanity. The Maitriyana then works for the sacred human rights, such as peace, healthy living and sustainable environment, considering that the Right to World Peace is an integrative right without which the other individual and collective rights are irrelevant or lack of validity. The conception of the human right to peace reaches a global and universal validity, reaffirming the intrinsically free and spiritual character of human nature, so it requires all the world's governments to accept these ethical foundations in order to reach the future. Therefore, the spiritual master teaches that peace is inherent in the dignity of the apprentice, but it is also intrinsic to the world of tomorrow where peace and health - the appropriate life - will be the heritage most protected by the peoples. World peace is the full main requirement of Liberty and Human Rights, providing equality and fraternity to all the peoples. Peace, justice and compassionate wisdom (prajna-karuna) form a mystical triangle that is the platform of genuine development of humanity. However, these supreme practices depend purely and solely on the identification of the causes of global ills, seeking their prevention from mental roots. Thus the spiritual master works with courage for world peace and healthy life of all human beings, trying to transmit a style of existence empty of greed, hatred and delusion. It is only through this waiver that violence and war can be vanished, which requires the commitment not only of the apprentice and the State but also of all humanity. Peace is neither an individual nor a state issue but it is universal. Contemporary problems demonstrate that it is fundamental a new system of planetary civilization which is not governed by war but by pacifism, influencing the levels of what is individual, national and global. This Way of peace must be guaranteed by the protection of justice, stability of knowledge and harmony of ecology, by consolidating democracy, solidarity and hope as international values that prevent the apparition of discrimination, conflict and genocide. The Free and Enlightened Being (Arhat-Bodhisattva) then requests the peoples to abandon power of the armed forces and replace it by the power of reconciliation. In this sense, the revolutionary contemplation (kakumei zen) is a call to selfless acts towards the good of others, by promoting the transmission of ethical values based on righteousness, knowledge and interexistence. These universal principles are essential for the construction and development of peace civilization, because they respect the inherent dignity of life at all times. Thus the spiritual master brings a message of love that can heal and transform the world, strengthening the transindividual identity of the peoples. This project of globalization of peace that Buddhist socialism solemnly proclaims does not lead to uniformity and absence of conflict, but rather to unity in diversity and the overcoming of illusory divisions of any kind, whether political, economic, cultural or environmental. Faced with threats of discrimination, violence and war, the Maitriyana emphasizes a higher modality of learning, by teaching the individual a critical thinking that is capable of taking responsibility for one's life. In this way, the apprentice who learns libertarian meditation can take on the challenge of changing the internal and external world, by modulating his own destiny on the understanding that peace is not an abstraction but rather a practice and lifestyle. Definitively, peace is a process of Ascension from oppression and alienation to Liberation and Openness (Sunyata), being a spiritual evolution based on solidarity as key to the future of humanity. Therefore, Buddhist Socialism adopts the flag of peace, justice, education and ecology in order to save the present and future generations, assuming the messianic mission to protect life, intelligence and Spirituality in the whole Universe. This is the major chance to change the course of the world's self-destruction, teaching a pathway toward peace and true progress of peoples. This Purpose (Dharma) shows that the Maitriyana is a Way that safeguards the ethical and spiritual heritage of all humanity, protecting the universal values from the attacks received by the superficial and materialistic society. This obliges the Buddhist Socialism to denounce the raw capitalism as a system devoid of equality, the same way as authoritarian communism is denounced due to its lack of Liberty. Indeed, the foundations of a peace civilization not only require Liberty and Equality but also Fraternity and Solidarity among all human beings, eradicating war, poverty, exclusion, discrimination, ignorance and violence. The meaning of life discovered by Maitriyana is in peaceful coexistence, generosity, reason, full consciousness and humility. Only the ethical responsibility and a detached will, characteristic of the peak knowledge (satori) and compassionate wisdom (prajña-karuna), nourish the existence of humankind and sublimate the death and war drive into life and peace drive by transforming lances into ploughs and rose petals. 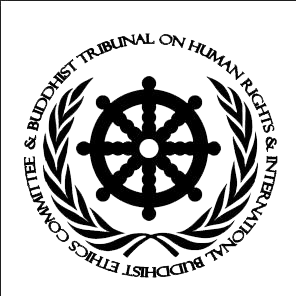 Therefore, the teachings of the Free and Enlightened Being (Arhat-Bodhisattva) are the most noble act and a gift that can be given to generations of present and future, celebrating the healthy and appropriate life through the Universal Declaration on the Right to World Peace, which is the maximum instrument of Buddhist Socialism to respect spiritual nature and the dignified existence of peoples. The Maitriyana is the maximum representation of the utopia of human rights, by practicing them and fulfilling them through the revolutionary contemplation (kakumei zen) in order that the world has a new dawn based on concrete guidelines of peace, justice, education and ecology. Tolerance, non-violence, understanding, detachment, solidarity and life without fear are the fruitful conditions for the future of the Great Awakening (Maha Bodhi) of all humanity, building the bulwark of peace in the spirit of all peoples of the Earth.